Would you make a good photographer? Take our career test to find out how you match with this and over 800 other careers. What is the workplace of a Photographer like? A photographer is a professional that focuses on the art of taking photographs with a digital or film camera. Photographers use artificial and/or natural lighting to snap pictures of various people, places and things in a variety of settings. Some photographers focus on studio work, while other explore the natural, outside world. 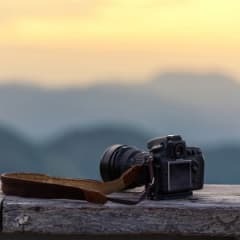 There are a variety of photography niches that one can choose from and be able to uniquely showcase their artistic ability with. A photographer generally works in a freelance capacity, and is hired for specific jobs by numerous clients. Some photographers work exclusively in certain segments of the industry, such as wedding, graduation and other event-type settings, while others do mainly corporate work, and spend most of their time taking photographs that will appear on business websites and other promotional material. Still others, however, focus more on the artistic side of photography, and choose their own subjects and material that they wish to shoot. Other forms of professional, full-time photography involve taking stills for motion pictures, taking pictures for crime scenes in cooperation with local and federal law enforcement agencies, and taking pictures for digital and print newspapers (photojournalist) - though often newspapers will work with a photographer on a freelance basis rather than hiring him or her full-time. A part-time or freelance photographer who is hired by a client is responsible for following the client's wishes down to the finest details, as well as for setting up a business model that makes pricing and options clearly visible and accessible. Finally, photographers are responsible for the digital or physical development of their pictures, and may also be responsible for small or heavy editing of their pictures. For physical prints, a photographer will be required to know how to best develop their film, or will be expected to hire other professionals to develop their film for them. The editing process of photographs, on the other hand, may include simple cropping, or could include changing colour schemes, lighting, and adding or removing objects from pictures to 'clear them up.' Some clients will choose to edit the pictures themselves, while others will expect the photographer to do the necessary photo editing. Wedding photography is a very specialized type of photography. The wedding day is typically one of the most important and memorable days in a person's lifetime, and one that will be remembered for years to come. Therefore, for most couples, regular photographs just won’t do. Professional wedding photographers are hired to capture a couple's irreplaceable moments by taking creative, candid and beautiful photographs of the wedding ceremony and reception. Before even photographing a wedding, the photographer corresponds with the clients for months, or even a year or two, before the actual wedding date. Getting to know the clients and understanding their likes, dislikes, and their ultimate vision is important, so that when the wedding day comes the couple feels comfortable enough to let their true personalities come out and shine. Once details are agreed upon, a standard written agreement is signed between the bride- and groom-to-be and the photographer. After the event is over, the images are processed as quickly as possible, the wedding photographer and couple will meet to go over the images, and ordering details are finalized. A high level of customer service is just as important after the event as before it - good customer relationships can lead to family portraits and portraits of their children in years to come. Fashion photographers are responsible for photographing apparel, accessories, and fashion models, as well as collaborating with hair stylists, fashion stylists, makeup artists, and fashion designers. A fashion photographer can either work freelance or be hired by a fashion designer, fashion publication, fashion house, advertising agency, or a fashion/beauty magazine. Through their photographs, fashion photographers are able to create a certain aura and define what beauty and style is. Responsibilities typically involve setting up and running photo shoots, communicating with make-up artists and fashion designers to best represent their vision, and editing the photographs. Real estate is a very competitive industry, filled with ambitious agents looking for their next sale. Selling real estate is about setting yourself apart from the competition, and one of the ways that can be done is by capturing beautiful and enticing photos of a home that is for sale. Real estate photographers specifically hone in on this area of photography, creating photos for real estate agents and their property listings on the MLS (Multiple Listing Service). This type of photography is somewhat detached from most of the artistic freedom one can enjoy with other forms of photography. Real estate photographers provide a much needed service for a very fast-paced industry. However, because the photos are temporary and, for the most part, don't have much sentimental value, the photographer can concentrate on producing a top notch product that can be duplicated from one photo shoot to the next. Travel photography involves taking images that express an area's people, cultures, customs, landscape, and history. However, travel photography, unlike other types of photography like fashion, wedding, or real estate photography, is harder to monetize. Travel photographers used to earn money through magazine assignments and stock photography. However, now that the stock photography market has shrunk, more and more photographers are using other ways to earn a living such as blogging, commercial projects, and teaching. Careers in travel photography can be as varied as the destinations they serve. A big part of making a career out of this type of photography is by tapping into social media marketing, content development, negotiation, and sales. However, the first step is to just get out there and take some pictures - having a good portfolio is key in this genre of photography. A photojournalist is someone who photographs, edits, and displays images in order to tell a visual story. They are journalistic professionals that are skilled at interpreting and communicating an event through a photograph(s). The subject matter can vary greatly, all the way from social unrest in a foreign country, to issues and events happening at a local level. Photojournalists can work as freelance photographers, or can be employed by photo agencies, magazines or local newspapers. Employment areas include the internet, print, and television. An architectural photographer captures photos of buildings and structures with the aim of portraying them as accurately as possible. This may include the interior or exterior of any structure - from a residential home to the world’s tallest building. Most of us think that buildings are the main things that architectural photographers take pictures of, however, other structures also come under the architecture umbrella, such as bridges, monuments, towers, and windmills. One of the main challenges with this type of photography is composing a shot properly. Technical problems need to be solved such as finding the best vantage point to show mass and shape or looking for the best way to depict spatial depth and clarity. Food photography is a very specific genre of photography - it is still life photography that is used in cookbooks, blogs, magazines, social media, advertisements, and packaging. The 'key ingredient' is to capture the image in a way that makes the viewer's mouth water. This is done by the photographer's extensive understanding of light, colour palettes, and styling trends. In order to work in this field, a good understanding of the food one is photographing is very important, as many food items can easily melt or wither which can make it quite challenging to work with. Food photographers typically work in collaboration with art directors, directors, food stylists, prop stylists, and assistants. As with any genre of photography, food photographers should always have both a print and digital copy of their best work to show potential clients. A sports photographer specializes in taking pictures of athletes and sporting events. At big events, sports photographers usually have VIP access, giving them the best vantage point for seeing the action. This type of photography is typically used for editorial purposes - sports photographers usually work for newspapers, news wire agencies or sports magazines. However, sports photography can also be used for advertising purposes, whether it's to build a brand or to promote a sport. While most sports photographers work full-time for publications and sport teams, others prefer to work as freelancers, picking and choosing who they work for. Working conditions vary depending on the type of sport being covered - sports photographers may choose to shoot only athletes, only games, or only cover extreme sports like rock climbing or sky diving. Newborn photography is one of the most rewarding yet difficult genres that a photographer can get into. This is the only area of photography that involves a photographer being completely responsible for the safety and welfare of another human being. Newborns are delicate, must be handled correctly, and are relying on someone to take care of them at all times. This is typically the parent's responsibility, however for the few hours the infant is with the photographer, the parent's have to trust the photographer to take on this responsibility. The average newborn photo session is three to four hours - most of that time is spent settling, cuddling, soothing, and posing the baby (and not taking photos). The actual time taking photos only amounts to a few minutes of that three to four hours. Each baby is unique, and so is each session. The baby will dictate the session and how it goes - typically, the calmer and less stressed the photographer is, the better the session will go since babies can pick up on stress. Understandably, most newborn photographers will do just one session per day. Beautiful photographs of newborns are not always the easiest to capture, but the challenges are what make it so rewarding and profitable. A booming newborn photography business can be realized by combining technical skills, business know-how, and a good understanding of babies and their parents. Portrait photography focuses on capturing a person’s likeness by having an individual sit or pose for the camera in a specific way. Typically, the most prominent part of a portrait photo hones in on a person's face. Other components, such as backgrounds and props, are still visible but are not the main focus. A portrait photographer will often spend a few minutes posing the subject (or subjects) for each picture. Paying attention to small details, such as a slight tilt of the head, a soft gaze, or a natural placement of the hands, is key to taking successful portrait photos. The subjects of portrait photography are usually everyday people (not models). Memorable lifetime events can be captured in school photos, dance recital photos, graduation photos, and family portraits. Landscape photography can be a preferred genre of photography for a variety of reasons, such as recalling a personal observation or experience while traveling, wanting to be involved with nature and the elements, using it as an escape from the artificial world, or simply having an appreciation of natural environments and having a desire to see it preserved. Many landscape photographers don't want to show any human activity and instead want to display a pure portrayal of nature that is devoid of any human influence. Features such as light, weather, and strong landforms are usually brought to the forefront. On the other hand, other landscape photographers consider urban settings, industrial areas, farm fields, orchards, and gardens as their definition of a landscape. This genre of photography can be hard to monetize but can be done with excellent marketing skills. Aerial photographers take pictures from the air, usually from helicopters, small airplanes, drones, blimps, balloons, parachutes, pigeons, kites, and rockets. Photographs can be taken by the photographer with a hand-held camera, or cameras can be mounted and triggered remotely or automatically. This type of photographer often works for architects or real estate developers who require aerial photos when looking for potential building locations or when marketing properties. Air-to-air photography is a bit different than aerial photography, in that it specifically focuses on chase planes that "chase" and photograph other aircraft in flight. Are you suited to be a photographer? Photographers have distinct personalities. They tend to be artistic individuals, which means they’re creative, intuitive, sensitive, articulate, and expressive. They are unstructured, original, nonconforming, and innovative. Some of them are also enterprising, meaning they’re adventurous, ambitious, assertive, extroverted, energetic, enthusiastic, confident, and optimistic. Does this sound like you? Take our free career test to find out if becoming a photographer is right for you. A photographer will be asked to work in any number of settings and environments. This can include working in comfortable studios in a big city, or working in the frozen forests of a remote country. A photographer is one of the few professionals that could be wearing shorts and a t-shirt one day, wearing a tuxedo the next, and a winter coat and boots the day after that. Most photographers that are serious about their craft will also have a home office or studio that will include a place to work on digital or physical photographs for the purpose of development and/or editing work.